In the Colour Energy Course that I attended last year, we did an in-depth exploration into each spectral colour. 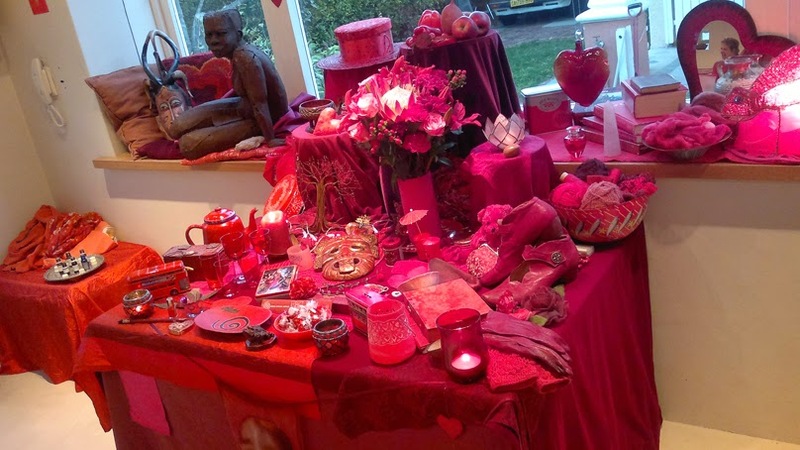 Each week we focused on a particular colour and it's associated energy Chakra. We explored the colour's energy through senses, meditation and painting using only the tones and hues of that colour. For each class we were asked to dress in the colour we were exploring that week. A still life, made up of various objects in the colour was set up in the studio. Little bottles of essential oils associated with that Chakra and colour were set out on a tray for us to smell. Even the food and drink that we had during our tea break was in the colour we were exploring. 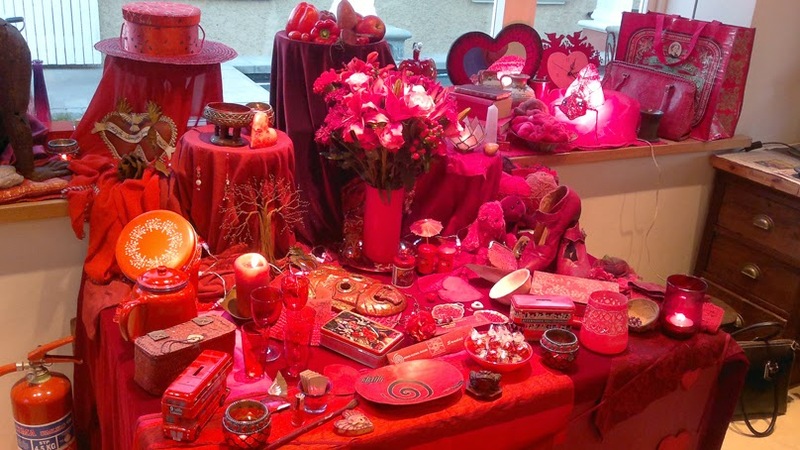 We started with the colour RED. Red governs the Base Chakra, also known as the Root Chakra or Muladhara, which is situated at the base of the spine. It is associated with basic survival, grounding, security (financial, career, home, physical safety, basic needs), vitality, stability and courage. When we entered the studio on this day the sight that greeted us took my breath away. Red is my favourite colour and the beautiful and carefully put together still life had me in awe. I felt warm and energised. It was interesting to witness other peoples reactions to this strong and energetic colour. There were only two of us that loved it. The others found the colour overwhelming. Dizzying. 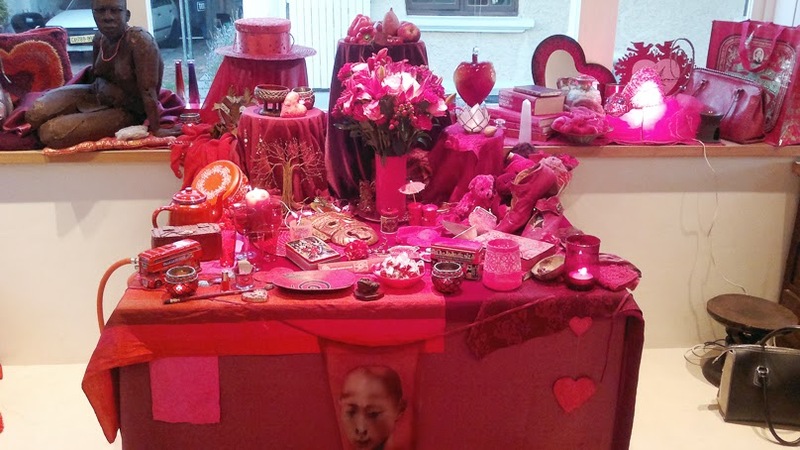 We sat around the still life soaking in the colour, observing the various shades and tones of red. We smelled essential oils like Cedar, Patchouli, Frankincense and Myrrh. We then mixed up some paint making six different shades and tones of Red. When we began to cover our canvas paper with paint I started to panic. I didn't know where I was going. It felt like I was making a big mess. The idea was to paint with intuitive spontaneity. I do find it hard to work freely and loosely without trying to paint a 'picture' or anything in particular. I used an Indian textile printing block (I LOVE them) as well as some bubble wrap and a piece of plastic mesh to apply paint and add texture to my page. 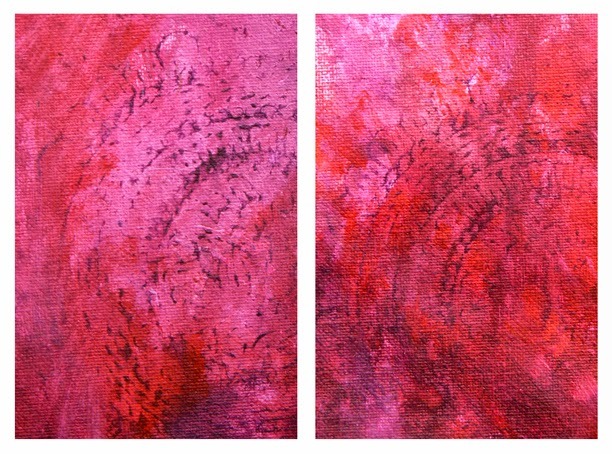 Marks made using an Indian textile printing block. After our tea break we had a look to see if any shapes or figures were emerging from our work. I turned my page 90 degrees, 180 degrees, 270 degrees and then back to the way it was. Nothing. It was only when we had about 10 minutes left to paint that I saw the shape of a snake's head appear. The texture that I'd created with the plastic mesh and bubble wrap looked a lot like snakeskin. I have always believed that I can't draw from my imagination but in this instance, with no reference pictures of snakes available, I had no choice. I closed my eyes and tried to picture a snake curled up and raising its head. I wasn't sure which way a snake curled, inward or outward, so I just painted what I saw in my picture by adding a few shadows here and there. 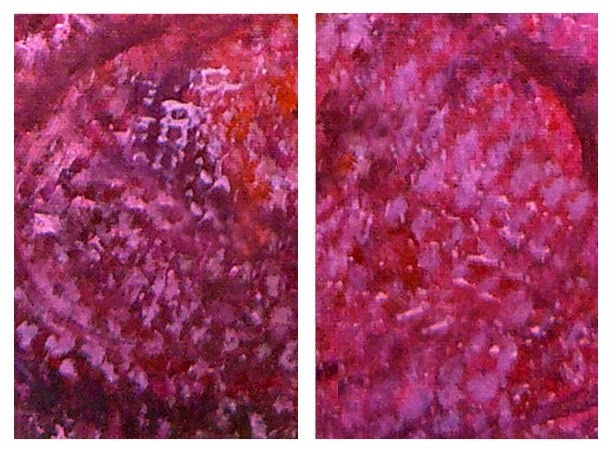 'Snakeskin' texture created by applying the paint with a piece of bubble wrap and a piece of plastic mesh. My final painting. A RED snake. 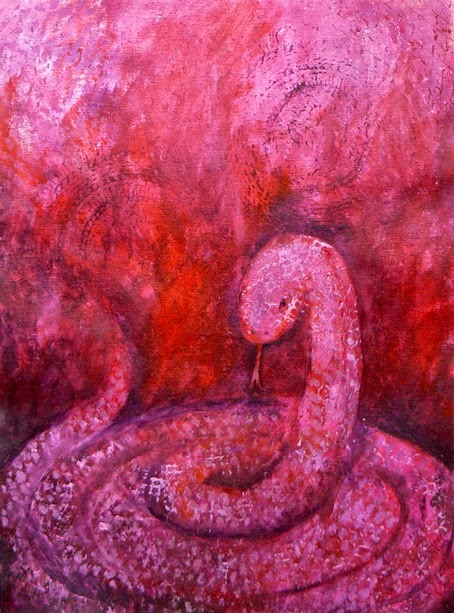 As I sat looking at my painting, I remembered that a coiled, sleeping serpent was the symbol of the Kundalini - the latent female energy believed to lie coiled at the base of the spine. It was something I'd learnt about many years ago when I practised Yoga regularly. I immediately thought, "How predictable. How obvious. How contrived." But thoughts of a serpent, Yoga or Kundalini hadn't entered my mind while I was painting. It wasn't something I'd purposefully done. It really was the result of painting freely, intuitively and spontaneously. The other thing about my painting was that the serpent was not sleeping. "Kundalini is a dormant energy within most people. In Hindu mythology, Kundalini is a serpent goddess who lies asleep at the base of the spine, coiled three and a half times around the first chakra.Her name is Kundalini Shakti, and she represents the unfolding of the divine Shakti energy, the energizing potential of life itself, a living goddess who enlivens all things. Circumstances that stimulate Kundalini awakening are many and varied, but are usually triggered by such things as extended periods of meditation, yoga, fasting, stress, trauma, psychedelic drugs, or near death experiences."